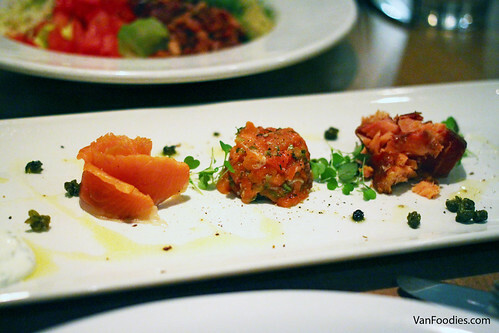 The tartare was creamy, well seasoned; it tasted fresh but it also had the slight fishiness in all salmon. I enjoyed the sweetness from the salmon nugget; it wasn’t too dry and the flavour was quite intense. Lastly, I’m a sucker for smoked salmon so I could really have a few more slices of the cured salmon. The cured salmon was rather mild in flavour, though. 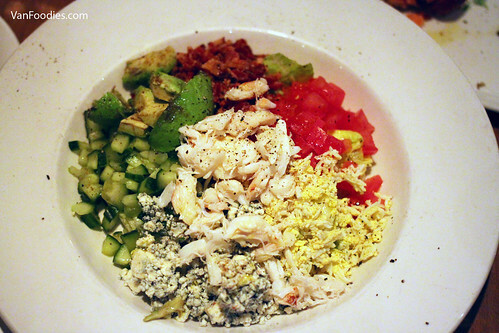 The Dungeness Crab Cobb Salad can easily be your dinner. The portion size was decent. There was plenty of sweet Dungeness crab meat. The bacon bits brought smokiness, salt and crunch; eggs and avocado added creaminess; tomatoes and vinaigrette were the tangy, acidic components of the plate. Frankly I don’t often eat blue cheese, but combined with everything else on the plate, you needed the subtle pungent blue cheese to make the dish pop. Wow I would eat the Pan Seared Haida Gwaii Sablefish again and again. 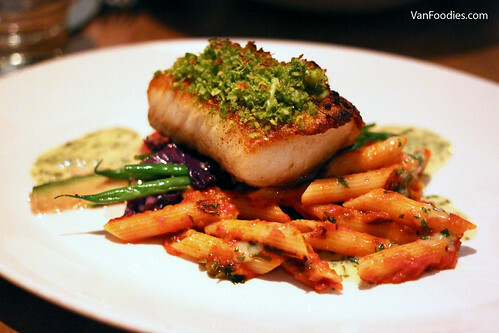 The sablefish was cooked perfectly — crispy on the outside, then the meat was tender and flaky. The dungeness crab crust was good, but I couldn’t really see or taste much crab meat. The penne alla puttanesca had just the right balance of acidity from tomatoes and saltiness from the olives. The veggies were done really well on the plate; there was a good snap on the green beans and kale was tender. I’m more impressed when restaurants cook their sides well. 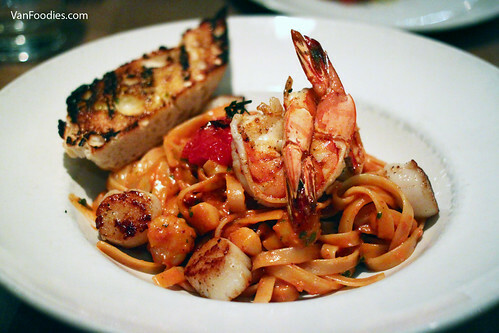 The Nova Scotia Scallop Fettuccini reminded me of my friend JX because she often orders seafood pasta at restaurants. I think she would like this one. The tomato sauce was creamy with a kick, and there was a hint of sweetness. Pasta was al dente; there was a good sear on the scallops, with nice caramelization. For an extra $5 you can add prawns to this dish. The prawns were decent sized, meaty and crunchy. This was a filling plate, but a very satisfying dish. For dessert, I was recommended to try the Banana Cream Pie. Now, I should start by saying that I don’t really banana flavoured things – I eat bananas and banana bread and that’s about it. Other banana-flavoured items just turn me off. So I’ve never had a banana cream pie before, but this was actually pretty good. It was light and creamy, with sweetness from the actual banana. The pie crust was a bit soft for my liking, though. 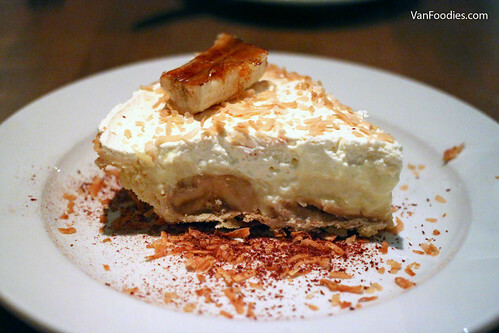 With the toasted coconut flakes, this was a summery, tropical ending to the dinner. 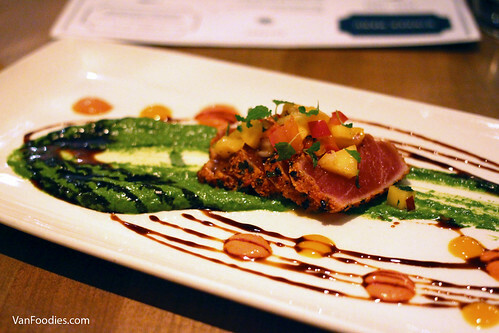 Totalling the three visits, I’ve tried a variety of dishes, mostly seafood, at WildTale. They cook their seafood very well – either the Pan Seared Haida Gwaii Sablefish, the Simply Grilled Fish from their fresh sheet, or their daily special, you can’t go wrong with ordering a seafood dish here. Three visits, three outstanding dinners, and I would come back again. Apparently they offer a lobster supper on Sundays and judging by the menu, it’s definitely worth a try! Disclosure: The meal was provided to me free of charge. However, the views and opinions expressed in this post are purely my own.